Replaces Value-Based Modifier. No data submission required. Cost will be calculated from adjudicated claims. As defined by CMS, “Cost is an important part of the Merit-based Incentive Payment System (MIPS) because it measures resources clinicians use to care for patients and Medicare payments made for care (items and services) provided to beneficiaries”. Requirements may change each Performance Year (PY) due to policy changes. Find Cost Requirements for each performance year of the program here. Review Cost measures on the Centers for Medicare & Medicaid Services (CMS) website here. Explore CMS Resource Library for the most up to date information concerning Cost. As displayed in the screen shot below, you can easily find files related to Cost by utilizing the search filters to narrow down your search by Performance Year, QPP Reporting Track, Performance Category and/or Resource Type. This file contains important and pertinent information relating to suggested documentation for each MIPS performance category. 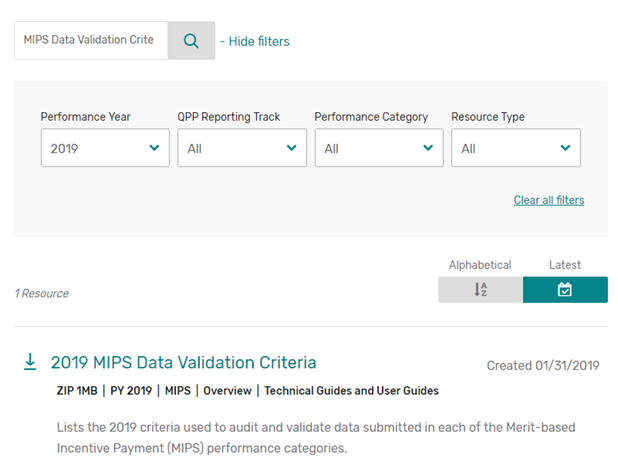 As displayed in the screen shot below, from the CMS Resource Library, you can easily find this file by selecting the performance year you are looking for and entering “MIPS Data Validation Criteria” in the key word search.